CDC Continues to Support the Global Polio Eradication Effort The eradication of polio is an important priority for the Centers for Disease Control and Prevention (CDC). We are closer than we have ever been to eradicating polio and it is critical that we take advantage of this opportunity. WASHINGTON, May 1, 2013—Despite enduring political and economic challenges, 20 fragile and conflict-affected states have recently met one or more targets under the Millennium Development Goals (MDGs), and an additional six countries are on track to meet individual targets ahead of the 2015 deadline, according to a new analysis by the World Bank Group released today. Afghanistan (9-12 May 2011): ICBL staff member Firoz Alizada conducted an advocacy mission in Kabul in cooperation with the Afghan Landmine Survivors' Association (ALSO) that involved eight meetings with government officials, parliamentarians, NGOs, human rights institutions and mine action stakeholders. 1. Every country with persistent polio transmission, with the exception of India and Angola, has had more cases so far in 2011 than they had by the same time last year. Chad, Afghanistan and DR Congo have already exceeded their entire 2010 total. 2. The rate of occurrence of new outbreaks serves as an ongoing reminder that many countries in the world are under threat from the ease with which polio could be imported across their borders. 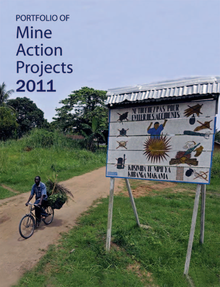 GENEVA - Mine action initiatives in 29 countries, territories or peacekeeping missions will cost $498 million in 2011, according to the 14th edition of the annual Portfolio of Mine Action Projects, released today by the United Nations in Geneva. 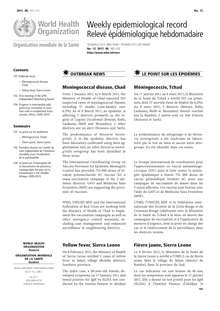 The portfolio is an annual snapshot of the impact of landmines and explosive remnants of war in countries or territories with mine action programmes.